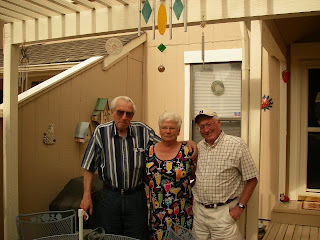 During our stay in the Denver area, we biked to Longmont to visit Belinda's dad. With the aid of the Denver Bike Map and Bicycle Colorado we rode a 50 mile route that included 3 major bike paths and 5 bike routes. We started from south Denver and rode up the Platte River bike path along the Platte River. 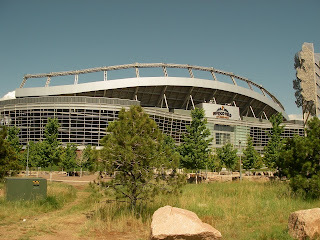 When we left the path, we rode right by Invesco Field where the Denver Broncos play. 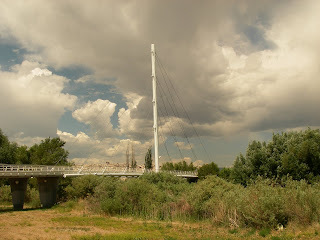 Heading further northwest, we joined the Clear Creek bike path and then transitioned to the Ralston Creek bike path by a very unusual bridge. We soon climbed the ridge near Boulder and then dropped down into the farmland south of Longmont. Late in the afternoon, we reached Gisela and Peter's house where we stayed two nights. Here they are pictured with Belinda's Dad on the left. After two days and much good conversation, we headed back to Denver for the Fourth of July. We are much impressed by the bike paths and routes in the Denver/Boulder area. We feel we could go anywhere in Denver by bike! Hey, John and I are online at LaVonne and Ernie's, so thought we'd post another comment. I did post a comment (I believe it was on your 6/25 entry, my reply being on 6/29). We came down here for the 4th, and Jim and Sue came down from Comptche. Looks like you guys are making progress! We're still dealing with the fires out here (Big Sur area is still burning bigtime), but at least the smoke has finally cleared and we can see the sky again. We're heading back to San Jose today and I'll be heading back up to Sacto tomorrow AM.